Mary Byrne, the convener of the anti-fluoridation activist group Fluoride Action Network of NZ, is promoting “alarming information” about incidence of neural tube developmental defects like spina bifida with the implication they are caused by community water fluoridation. Her authority for this is Declan Waugh! Any critical examination of Waugh’s claims on fluoridation (and there are many) would show him to be the last person one should trust on the issue. 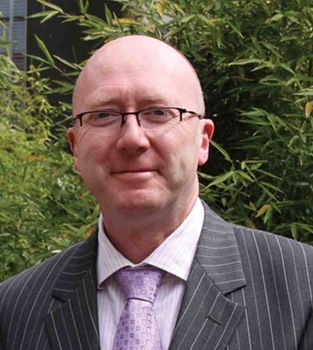 Unfortunately, though, he does seem to fool some people – using a mixture of extensive, but misleading, citation of scientific papers and claims about the high incidence of many illnesses in the Republic of Ireland. Anti-fluoride activists love to quote him as “scientific proof” for their own extreme claims and, worryingly, the Hamilton City Council was persuaded that he is indeed a reliable “expert” – citing one of his reports in the list of 10 documents which convinced them to stop fluoridation last year (see When politicians and bureaucrats decide the science). Very often simple checking will show his claims about the incidence of illnesses are actually completely wrong, and the scientific papers he cites don’t actually say what he claims. Completely dishonest but it seems you can fool some of the people some of the time with fancy sciency-looking reports. Especially if your citations are so intimidatingly extensive few readers have the energy to check them. Here I will take apart the fear mongering he is currently promoting over spina bifida and similar neural defects. “This comprehensive national audit over three years found that the incidence of neural tube defects (NTDs) increased slightly during the period studied, reversing the trend of the previous ten years. NTD incidence had increased from 0.92/1 000 in 2009 to 1.17/1 000 in 2011. And nowhere was fluoride implicated as a cause of this. So no basis for Waugh’s fear mongering and implication of community water fluoridation as the cause. However, I imagine the average anti-fluoride activist would be aghast at the idea of a social health policy involving mandatory folic acid food fortification and would campaign against it. 1: The old trick of using a brief report from an area of high dietary fluoride intake. In this case the paper of Gupta et al (1994). This brief 2 page report studied children suffering dental and skeletal fluorosis in India. Drinking water concentration was high (4.5 to 8.5 ppm compared with the recommended 0.7 for community water fluoridation). Fourteen of the 30 children studied showed spinal bifida occulta (the mildest form which usually presents no problems) on X-rays but not on clinical examination. Although the incidence in this small sample is higher than the 20% normally found in average spines the number of subjects is low so no conclusions are possible. In fact, all the authors did was to propose “a randomised controlled study to evaluate a possible correlation between spina bifida and high fluoride intake.” The also pointed out that they could not find any literature reports correlating spina bifida with fluoride. So all pretty speculative – but enough for a desperate anti-fluoride “authority” like Declan Waugh to do a bit of scaremongering. 2: Waugh goes out of his way to suggest a mechanism for community water fluoridation causing neural tube defects – fluoride reduces folic acid concentration in the body! And he manages to cite a couple of scientific papers to support his ideas. Problem is – they don’t. He argues in a 2012 report (which he describes as his “main report”) that “Fluoride is known to be an inhibitor of enzymatic activity and research has identified fluoride as an inhibitor of homocysteine hydrolase363“ and this causes a decline in folic acid levels. The cited paper is Mehdi S, Jarvi ET, Koehl JR, McCarthy JR, Bey P. The mechanism of inhibition of S-adenosyl-L-homocysteine hydrolase by fluorine-containing adenosine analogs. J Enzyme Inhib. 1990;4(1):1-13. Waugh is citing work using “fluoride-containing adenosine analogs” to make the claim about the fluoride anion. Specifically, the compounds (Z)-4,5′-Didehydro-5′-deoxy-5′-fluoroadenosine, 5′-deoxy-5′-difluoroadenosine, and 4′,5′-didehydro-5′-deoxy-5′-fluoroarabinosyl-adenosine – not fluoride. Declan Waugh has just pulled out any old citation referring to fluoride – maybe he hasn’t even read past the title of the paper. But as is often the case with these sorts of admissions, the very lack of evidence appears to be used to infer a cause. He is advancing the fallacy that the lack of evidence really means the evidence is there but just hasn’t been found yet – probably because evil scientists are conspiring to prevent the necessary research. The old trick of making a wild claims, suggesting something as a possibility and then promoting the idea as some sort of scientifically proven fact in his scaremongering. Ideologically motivated political activists often make extreme claims. Perhaps they feel their claims will never be challenged because they are aimed at their own supporters. Sometimes I think it is because they just don’t get challenged enough by reasonable people. I have previously shown examples of misrepresentation of science by local anti-fluoride activists (see Fluoride and heart disease – another myth , Anti-fluoridation porkies – Mullinex’s rats, Fluoridation: the hip fracture deception, Anatomy of an anti-fluoridation myth , Fluoridation – the IQ myth, Activists peddle chemical misinformation for fluoridation referenda, Cherry picking fluoridation data, Fluoride sensitivity – all in the mind?, Fluoridation – topical confusion, Fluoridation – it does reduce tooth decay, Fluoridation – are we dumping toxic metals into our water supplies?). Here’s another blatant example – their misrepresentation of dental fluorosis. In this case it involves knowingly using the wrong photographs while quoting a Ministry of Health (MoH) source on the subject. I have posted below both the official photographs used by the MoH and the photographs they were replaced with in the anti-fluoridation quote. This blatant misrepresentation occurs on the official website of the Fluoride Action Network of NZ (FANNZ). But first, this is what I wrote about dental fluorosis in my exchange with Paul Connett. The graph illustrates the nature of dental fluorosis observed in New Zealand. Proponents of fluoridation do acknowledge dental fluorosis in a negative, although minor, aspect of fluoridation. Opponents of fluoridation will often quote high values of the incidence of fluorosis which ignore the fact that much of it is “questionable” and/or “very mild.” These grades are really only cosmetic and usually can only be detected by a professional. Opponents may also hide the fact that the incidence of fluorosis for children living in fluoridated may often be the same as, or only slightly greater than, the incidence for children living in non-fluoridated areas. The graphs below shows the situation reported for New Zealand in the 2009 New Zealand Oral health Survey (see Our Oral Health). Health experts have generally concluded that the apparent rise in the incidence of fluorosis is caused by increases in other forms of fluoride intake, such as from eating toothpaste, and not from fluoridated water. 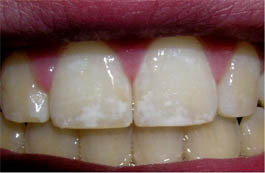 Tooth enamel fluorosis is one of a range of changes to tooth enamel. Living in an area with fluoridated water can increase the mild white flecks or streaks in the tooth enamel. 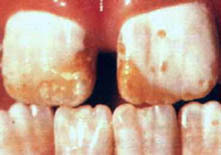 Severe enamel fluorosis involves brownish defects to the tooth enamel which may also be pitted. 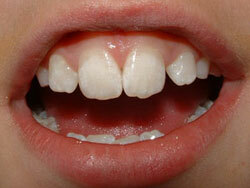 This form of enamel defect is uncommon in New Zealand. The most recent New Zealand information from 9-year-old children in Southland indicates that about 5 percent of children had similar defects. These defects were just as common in children who had received fluoridated water as non-fluoridated water and the level of these defects had decreased about three fold from about 15 percent of children in the mid-1980s. The quote here is from the FANNZ website page Dental health. Dental fluorosis is the outward sign that has a child has consumed too much fluoride – it is a bio-marker of over-exposure. 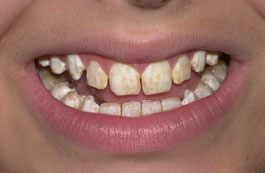 In New Zealand, dental fluorosis statistics are lacking, even though the Ministry of Health acknowledges this condition to be an undisputed side effect of fluoridation. According to the Ministry of Health*, “The most recent New Zealand information indicates that about 29 percent of 9-year-old children in Southland who had always received fluoridated water had these changes to the tooth enamel. This level had not changed since several earlier studies undertaken in the 1980s.” (Bold my stress). * Note this link goes only to the MoH front page – not the page from which the quote was taken and which contains the photographs. Now, I wonder why the link isn’t direct? So a blatant example of misrepresentation. Conscious misrepresentation at that because it involved substitution of the official photos by others. The intention was clearly to make the MoH seem to state that fluoridation causes severe fluorosis when the MoH clearly did not state that. I really wonder how these people sleep straight in their bed at night. The alignment of the poster above with a “balanced” duo of opinion pieces on fluoridation in the recent issue of the Journal of primary healthcare is just too good not to comment on. New Zealand drinking water should be fluoridated – No by G Mark Atkin BSc, LLB(Hons) Science and Legal Advisor, New Zealand Fluoridation Information Service, PO Box 9804, Wellington, New Zealand. Looks a bit uneven, doesn’t it? A Professor of Dental Epidemiology and Public Health “balanced” against a political activist? Worse, Atkin’s organisation is an astroturf one set up by the Fluoride Action Network of NZ (FANNZ). Rather clumsily, I add, as they use the same office address! (See Anti-fluoridationist astro-turfing and media manipulation). Still, I want to comment on the chemical arguments used by Atkin. He is effectively clutching at straws, using very naive interpretations of the chemistry of fluorosilicates and fluoride. As a chemist I find such opportunist distortion of chemistry offensive. Problem is, his and similar arguments are often presented by anti-fluoridation activists and lapped up by their supporters. There is some straw clutching going on here in the discussion of the chemistry of fluorosilicates and fluoride which distorts the real chemistry. The Nuclear Magnetic Resonance work of Finney et al (2006) (“Reexamination of hexafluorosilicate hydrolysis by 19F NMR and pH measurement”) showed complete decomposition of fluorosilicate species at neutral pH values on dilution. They also showed the presence of surviving fluorosilicate species at low pH values (3 and below) – which is of course irrelevant for water treatment. No one is going to produce drinking water at such acidic values. Atkins and his organisation are clutching at a very weak straw there. Reversion of fluoride to fluorosilicate? Atkin’s claim of reversion of fluoride to fluorosilicate “in acid stomach conditions” is also incorrect. He is relying on a simplistic misunderstanding of the nature of “dissociation” of fluorosilicate on dilution. It is important to recognise the “dissociation” of fluorosilicate species into fluoride and silica at neutral pH values is, in effect, a decomposition. Because of the polymerisation of the silica, and the olation and oxolation reactions involved, the equilibrium is driven to completion – in effect the silica is removed from the reaction. (While it may remain in “solution” or “suspension” for a time it is effectively inert – due to olation – as far as the equilibrium is concerned). What do I mean by olation? While monomolecular Si(OH)4 is formed on dissociation of the fluorisilicate it rapidly undergoes reactions which lead to exclusion of water and the transformation of Si-OH bonds to Si-O-Si bonds. Eventually this leads to formation of colloidal and solid silica. But even while in solution olation and oxolation reduces the reactivity of the silica species. Just as fluorosilicate species do not reform in your tap water, they do not reform in your stomach. Even if the silica is still in suspension it is no longer present as mono-molecular Si(OH)4 and is effectively inert. So despite the low pH there is no simple equilibrium. Remember too, your drinking water will contain silica derived from other sources besides fluorosilicate (which is probably a minor contributor). Sure, one can prepares solutions in the laboratory at pH values of 3 or less that contain fluorosilicate species – but once decompostion (involving loss of silica reactivity) occurs at neutral pH values the reaction is not easily reversed. Especially considering the time lapsed between decomposition of the fluorosilicate and drinking water entering one’s stomach. Yes, in the acid conditions of your stomach F anions will exist in equilibrium with the protonated HF species. This is also true for other weakly acidic anions – even sulphate – that is just simple chemistry. But, the real danger of the solution in your stomach is that it is very acid, it has a low pH – a very high concentration of hydrogen ions. It is the hydrogen ions that are corrosive. (If anything, the presence of weakly acidic anions like fluoride will actually lower the acidity by removing some of the hydrogen ions). One does not put one’s hand, or any other sensitive tissues, into acidic solution like this. However the stomach is built to handle these conditions. I understand the molecular species involved in the transfer of fluoride across the stomach wall cells into the blood stream is HF. (Once in the blood HF will convert to fluoride because of the higher pH). So clearly the low pH assists in uptake of F by the body. Don’t forget the concentrations of fluoride, and therefore HF, is actually very low. The protonated species in your stomach solution are not equivalent to the HF (or HCl and H2SO4) chemicals we are used to in their concentrated forms in the laboratory.